Drywall Joint Paper Tape is a quality tape designed for use with joint compound to reinforce gypsum board joints and corners prior to painting, texturing and wallpapering. Joint tape is super strong both wet and dry. The tapered edges offer invisible seams. 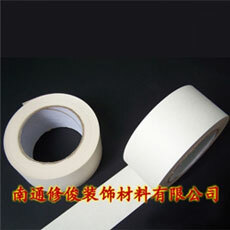 Joint tape is sparked, making it the type preferred by professionals. Other specification upon customer’s request. 1. Firmly press joint compound into wallboard joints over an approximate 4inch wide area. 2. Center Joint Paper Tape in compound, over hidden crack and embed tape into compound. Cover tape with a thin coat of compound. Remove excess. 3. Make sure nail heads are driven in at least 1/32inch. Apply joint compound to nail head indentations. 4. After bed coat compound is completely dry (at least 24 hours) apply another thin coat of compound and feather out to a 3-4inch width on each side. Apply second coat to nail heads. 5. Allow the preceding coat to dry and apply another thin coat, feathering out to a total width of about 8” on each side. Apply final coat to nail heads. 6. When completely dry, at least 24 hours after final coat, sand smooth. Finishing Inside Corners: Apply compound to both sides of corner. Crease tape and embed. Apply a thin coat on both sides of tape. When dry, apply a second coat to one side only. Let dry, then finish the other side. When dry, sand until smooth. Finishing Outside Corners: Use broad knife to apply the joint compound over the corner bead flange for the outside corners. The first coat should be approximately 6inch wide, and the second coat 6- 10 inch wide applied on each side of corner. Apply Joint PaperTape only at the recommended temperatures of the joint cement used. Store tape in closed cartons at normal room temperature in an enclosed, dry shelter.